Adventurers will be picked up early morning and driven through the stunning Sacred Valley, cradle of the Inca civilization and dropped off at the 4,316 m high Abra Malaga. Here bikers will change in to the kit provided by us (gloves and helmets) following a 20 minute briefing by our experienced tour guide. Then the fun commences freewheeling down quiet but challenging roads, past changing landscapes and ice capped mountains, you will not want to catch your breath until the first pit stop in Alfamayo, some three hours from your starting point. Here you can enjoy your box lunch provided by us, while taking in the endless panoramas. either single, double or three bed rooms. approximately half a mile. Be warned this is not for people who suffer from vertigo! The descent continues for just over two hours until you reach Qellomayo, a pueblito, where you will have lunch. Make sure you have saved enough energy for the final stretch, a riverside walk beside the Rio Vilcanota until reaching the delicious hot springs Colcamayo. Rejuvinate in the heavenly hot waters and forget your weary wake in these natural settings. Fully replenished, you will find the final stretch to Santa Teresa a sinch. Here you should sleep well in the family homestead after dinner. flanked by the grotesque peak of Salkantay. Your picnic here is unlikely to be forgotten for a while, gazing down on all those tourists who took the traditional Inca route because they did not know! It is only about a two hour walk down to the hydro-electric train station where the train departs for Aguas Calientes, the base town for Machu Picchu. Included is dinner at a local restaurant before retiring to your hostel with hot water and private bathrooms. An early rise today, as you will take the first bus to Machu Picchu at 5:30 hrs. 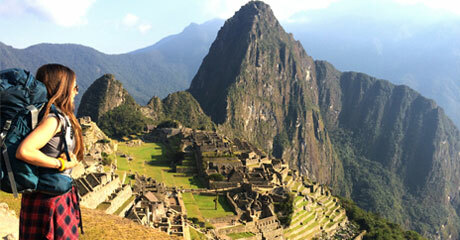 our guide will leave no stones unturned but feel free to challenge their knowledge of Inca history. Afterwards you have free time to dally with the llamas and show off your photographic skills. Those who still have the will can tackle Huaynapicchu, which actually looks down on Machu Picchu. A frequent bus service takes visitors back to Aguas Calientes, where you will catch the train to Hidroelectrica or Ollantaytambo and then the bus to Cusco. If you want to access to the Huayna Picchu mountain, must pay $ 20 (twenty dollars) additional.